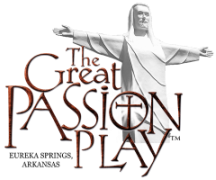 THE GREAT PASSION PLAY - An hour-and-forty-five minute reenactment of the last week of the life of Jesus Christ. Staged in a 4,000 seat outdoor amphitheater, the multi-level set, special lighting and sound effects, live animals, and a cast of 170 Biblical costume come together to create a thrilling epic drama. Performed from May through October. Weekends in May and August. Tuesday, Thursdays, Fridays, and Saturdays in June and July. Performed on Tuesdays, Fridays and Saturdays in September and October. (Special performances on the Sundays of Memorial Day and Labor Day weekends). THE HOLY LAND TOUR - a two-hour guided tour. Guests are transported back in time as they walk through a full-sized replica of the East Jerusalem Gate and Marketplace to Biblically inspired exhibits which include Moses’ Tabernacle in the Wilderness, Bethlehem Inn and the Nativity, the Upper Room, the Garden Tomb, the Walk with Peter, and other exhibits which depict life in Bible times. All exhibits have been researched archaeologically and historically for authenticity. Tours run on day of Play performances from 12:00pm-4:30pm leaving every 30 minutes. There is walking at each stop. The longest time walking at any one stop is approximately thirty minutes. BIBLE MUSEUM - a collection of over 6,000 Bible manuscripts in over 625 languages and dialects and fascinating artifacts. It features a 20-minute video presentation on the history of the English Bible. The Bible Museum is open every day except Sunday, 9:00am until 5:00pm. On days of Play performances, the Museum is open until 8:00pm (7:00pm after Labor Day). SACRED ARTS MUSEUM - Showcases hundreds of pieces of religious art dating as early as 9th century. Included are oils, acrylics, ceramics, wood carvings, mosaics, and other media. Also features all the works of renowned artist, Jack Dawson. Open every day before the Play from 11:00am - 8:00pm (after Labor Day until 7:00pm). Non-play days by appointment. GIFT SHOPS – An incredible selection of souvenirs, keepsakes, books, DVDs, resources, and other items. PARABLES FROM THE POTTER - A 20-minute presentation by our potter, Joe Smith. He actually forms a pottery vessel on the potter’s wheel and at the same time shares how God, the Master Potter, molds and shapes our lives. DAVID THE SHEPHERD - A 20-minute presentation by our shepherd, Kent Butler. David the Shepherd tells stories about Jesus, the Good Shepherd and also gives a hands-on demonstration with his shepherd sling. GREAT HALL BUFFET - An all-you-can/care-to-eat buffet featuring a full salad bar, hot vegetable bar and meat bar, dessert bar and drinks. Usually four entree selections including chicken and ribs. Served from 4:30 until 7:30pm (4:00pm until 7:00 pm after Labor Day) every evening the Play is performed. Designed to serve groups quickly and deliciously. all of the attractions on the grounds!